U.S. Navy, U.S. Shipping Board, steamship, etc. 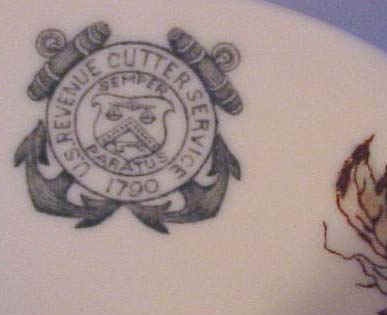 For U. S. Revenue Cutter Service dinnerware, please visit our Revenue Cutter Service Page ! 10488. 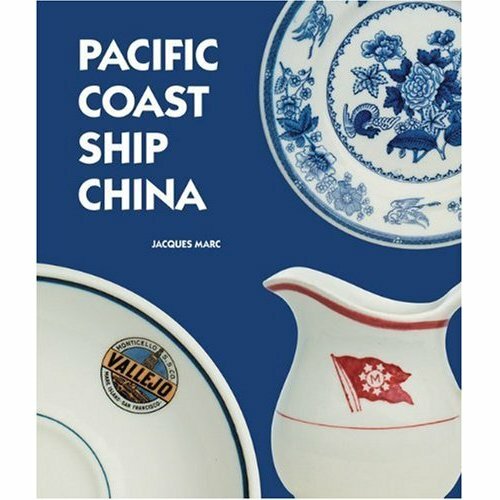 Marc, Jacques F. Pacific Coast Steamship China. UBC Press. 2009. 182p. Hardcover. 300+ color and 80 b/w photographs. At the height of Pacific-coast steamship travel in the late 1800s and early 1900s, passengers enjoyed a sit-down dinner served on china with silver flatware. Today, the only places you can still find this china is at flea markets and antique shops or by diving at old dock sites and on shipwrecks. Pacific Coast Ship China identifies and dates shipping china used along the Pacific coast of North America. It identifies more than 280 china patterns used on vessels and in-shore establishments of shipping organizations registered in Alaska, Yukon Territory, British Columbia, Washington, Oregon, California, Idaho and Hawaii; it describes patterns used in coastal, intercoastal and transpacific services. In addition to passenger vessels, it documents the china used by freighter operations, oil companies, government services and yacht clubs. This easy-to-use guide identifies almost 300 china patterns. It provides collectors, museum technicians, divers, history buffs and anyone else interested in identifying and dating Pacific-coast ship china with all the information they need. It also includes brief descriptions of 73 Pacific-coast shipping companies and government services including Lighthouse Service and Coast Guard. (M). $79.95. 20284b. 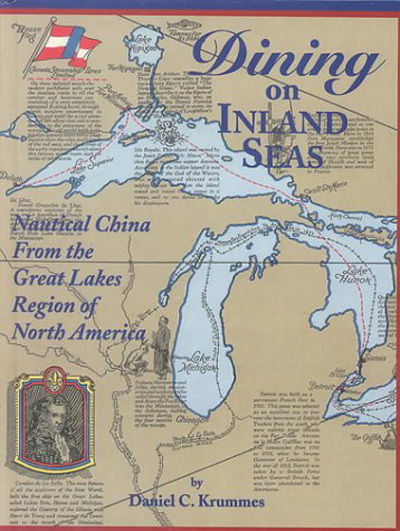 Krummes, Daniel C. DINING ON INLAND SEAS – Nautical China from the Great Lakes Region of North America . Traverse City . 1997. 225p. For over 150 years, passengers and crew aboard ships dined in tiny galleys and luxurious dining rooms. Many ships served food on china bearing colorful patterns that reflected the pride of the American and Canadian fleets. This extensive recent work covers Great Lakes ship china from the ornate propellers of 1840 to the mighty ore carriers of today. Included are chapters on nautical souvenir china and china from saltwater freighters and trans-Atlantic passenger liners that have visited the region. The hardcover book is illustrated with over 250 black-and-white photographs, with an additional 64 patterns displayed in a special color section. This 234 page guide takes the guesswork out of collecting Great Lakes ship china, the first to document, describe, and illustrate the china used aboard ships. The Author Daniel Krummes, an authority on Great Lakes ship china, spent a decade researching and cataloging china patterns. He brings you Dining On Inland Seas. Also includes china of the U.S. Lighthouse Service, U.S. Coast Guard, U.S. Navy and more. 8 1/2'' x 11'' Hardcover. Out of print, quite difficult to find. (M). $148. 16143. (bowl) U.S. Coast & Geodetic Survey c.1930’s. This is a scarce original early china dinnerware piece from the United States Coast & Geodetic Survey, manufactured of heavy white institutional type china, in the early years of the Twentieth Century for use in their survey ships’ wardrooms. With little is any wear, free of any cracks or major defects. Pattern consists of gilded eagle superimposed upon a triangle, within a solid circular border. Rim gilded (possibly 18k). In later years the circular boarder was changed and the words “U.S. Coast & Geodetic Survey” added. The National Geodetic Survey began operating in 1807 as a civilian organization. It was renamed U. S. Coast & Geodetic Survey in 1878, then reorganized as the National Oceanic and Atmospheric Administration in 1970. 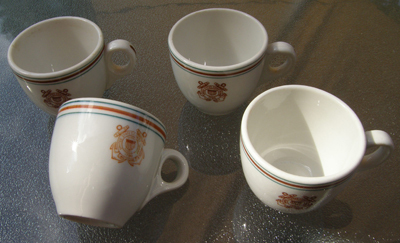 Bottom is marked “Buffalo China NCE”, and “Shaw New York 7-32” [distributor]. 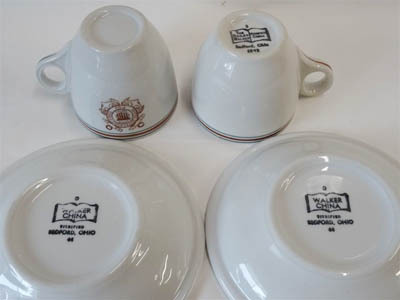 Shaw was a known distributor for Buffalo, Maddock, McNicol, Scammell and Warwick china companies. Bowl measures 6 ¼” diameter. (F-). $54. 12302. 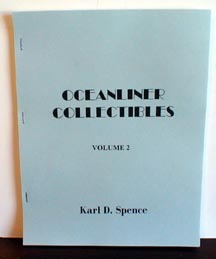 Spence, Karl D. OCEANLINER COLLECTIBLES - Volume 2. 1996. Slidell. 71p. Soft wraps, staple bound. Signed by the author. Mr Spence published this in 1996 as a reference that could be taken to antique shows, etc. The book pictures china from a number of coastal and Great Lakes shipping lines as well as some Transatlantic and Transpacific lines as well. Includes information on the shipping line routes, patterns, backmarks and more. Illustrated with 136 photos. Includes a list of references. (M). $28. 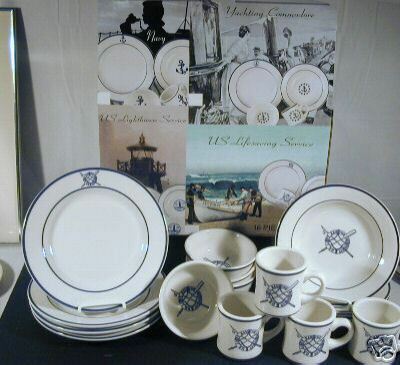 United States Coast Guard Silverplate Dinner Service. 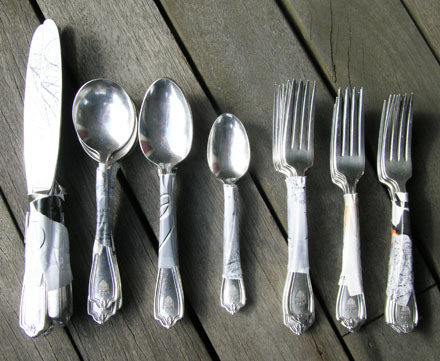 These beautiful United States Coast Guard silverplate pieces were for use in the Officer’s Mess and were of expected high quality construction and added to a most elegant table. 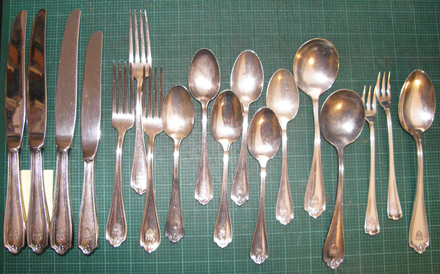 Pieces are of heavy weight silver plate by International Silver Co. and show a high degree of quality workmanship. Pieces are marked with a U.S. 13 star crest, some with “U.S.C.G.” above. 21371. 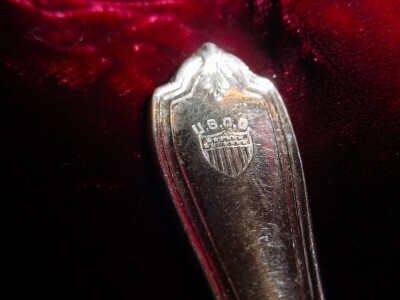 U.S. Coast Guard silver plate flatware marked with “U.S.C.G. and shield”. Up to 28 pieces available: (15 forks, 4 tablespoons, 2 dinner knives, 2 teaspoons, 6 soup spoons). $28 each. 21371. (silver plate flatware) U.S. Coast Guard marked “U.S.C.G.” with shield. Please inquire. 8341-104. (demitasse saucer) United States Coast Guard “U.S.C.G.” Dinnerwarec.1920’s – 1930’s. 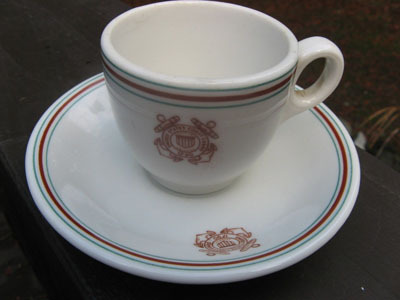 Scarce, original United States Coast Guard demitasse saucer in the rare early intertwined “U.S.C.G.” pattern. Saucer is back-marked “Shenango China, New Castle, Pa, Made For L. Barth & Son, New York.”. This pattern was used shortly after the merger in 1915 and mimics the earlier Revenue Cutter Service pattern. 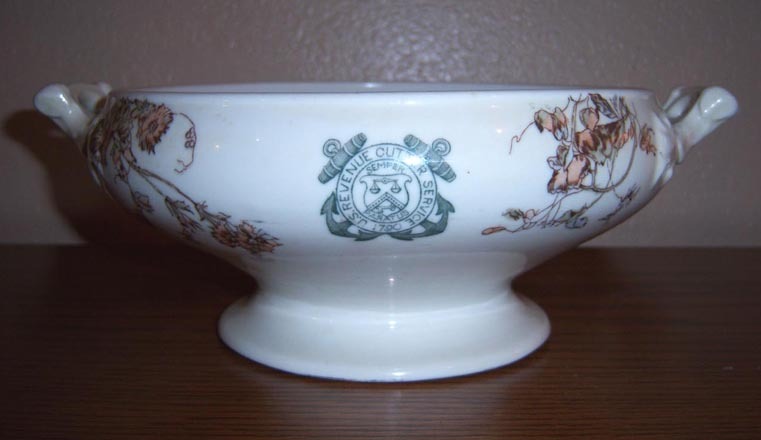 L. Barth & Son was a distributor of restaurant china and would have been one of the suppliers of china to the Coast Guard at the time the saucer was made. In Restaurant China Volume 2 by Barbara J. Conroy Page 414, the author states that this mark with the words New Castle, PA italicized was used circa 1920’s - 1930’s by Shenango and that frequently the name of the distributor accompanied the mark. Saucer measures 4 7/8” in diameter and is as new, possibly never used. One slight spot, manufacturing defect. Extremely rare pattern. (F-). $165. 8341-106. (bone dish) United States Coast Guard “U.S.C.G.” Dinnerwarec.1920’s – 1930’s. 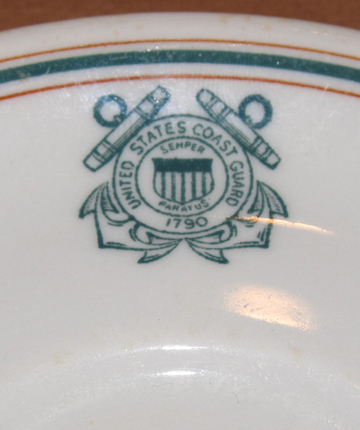 Scarce, original United States Coast Guard dish in the rare early intertwined “U.S.C.G.” pattern. 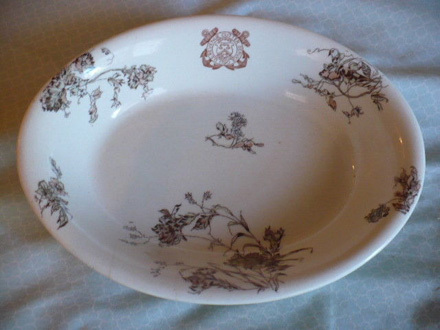 Dish is back-marked “Lamberton China.”. This pattern was used shortly after the merger in 1915 and mimics the earlier Revenue Cutter Service pattern. Dish measures 5 ½” in diameter and is in excellent condition. Extremely rare pattern. (F-). $165. This pattern is an intermediate pattern which includes the United States Coast Guard emblem in blue with crossed anchors surrounding Coast Guard shield, no stripes on rim. 8341-105. [cup] United States Coast Guard coffee cup. 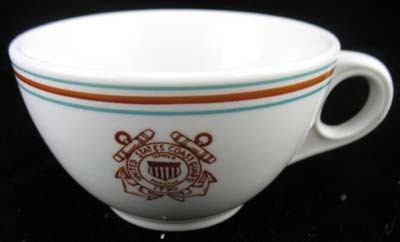 Scarce original early United States Coast Guard cup manufactured in the early years of the Twentieth Century for use in ships’ wardrooms and at some ‘stag’ stations. 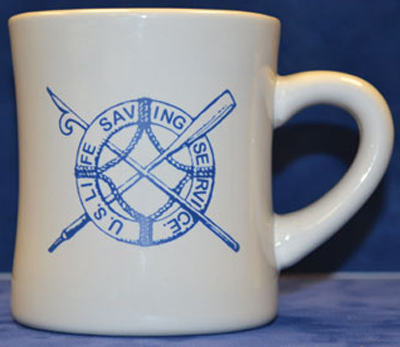 Made of heavy white institutional type china, cup is of the earlier pattern with the United States Coast Guard emblem in blue with crossed anchors surrounding Coast Guard shield, no stripes on rim. Bottom labeled "Jackson Vitrified China Made in U.S.A. Falls Creek, Pa. 1942". Attractive piece measures 3 ¾” in diameter. With little if any wear, clean, free of any cracks or major defects, scarce piece. (F-). $66. 8341-90. [platter] United States Coast Guard c.1940’s. Scarce original early United States Coast Guard platter manufactured in the early years of the Twentieth Century for use in ships’ wardrooms and at some ‘stag’ stations. Made of heavy white institutional type china, platter is of the earlier pattern with the United States Coast Guard emblem in blue with crossed anchors surrounding Coast Guard shield, no stripes on rim. 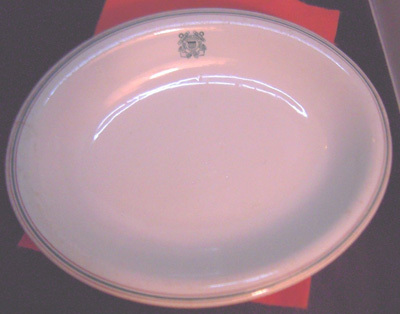 Bottom labeled "Jackson China Vitrified Made in U.S.A. Falls Creek, Pa. 1942” Attractive piece measures 13 ½” x 9 ¼” oval. Little if any wear, clean, free of any cracks or major defects, scarce piece. (VG+). $110. 8341-91. [platter] United States Coast Guard c.1940’s. Scarce original early United States Coast Guard platter manufactured in the early years of the Twentieth Century for use in ships’ wardrooms and at some ‘stag’ stations. Made of heavy white institutional type china, platter is of the earlier pattern with the United States Coast Guard emblem in blue with crossed anchors surrounding Coast Guard shield, no stripes on rim. 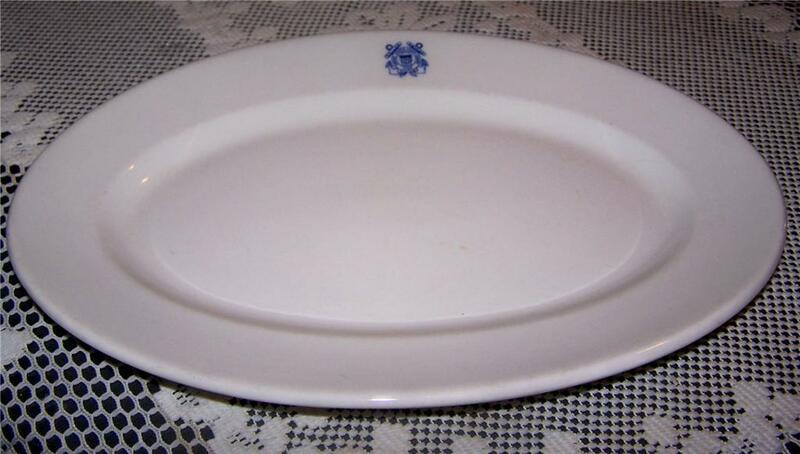 Bottom labeled "Jackson China Vitrified Made in U.S.A. Falls Creek, Pa. 1942” Attractive piece measures 13 ½” x 9 ¼” oval. Little if any wear, clean, free of any cracks or major defects, scarce piece. (VG+). $110. 8341-96, 97. [dish] United States Coast Guard. 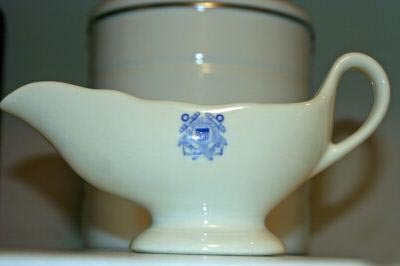 Scarce original early United States Coast Guard butter or small dish manufactured in the early years of the Twentieth Century for use in ships’ wardrooms and at some ‘stag’ stations. 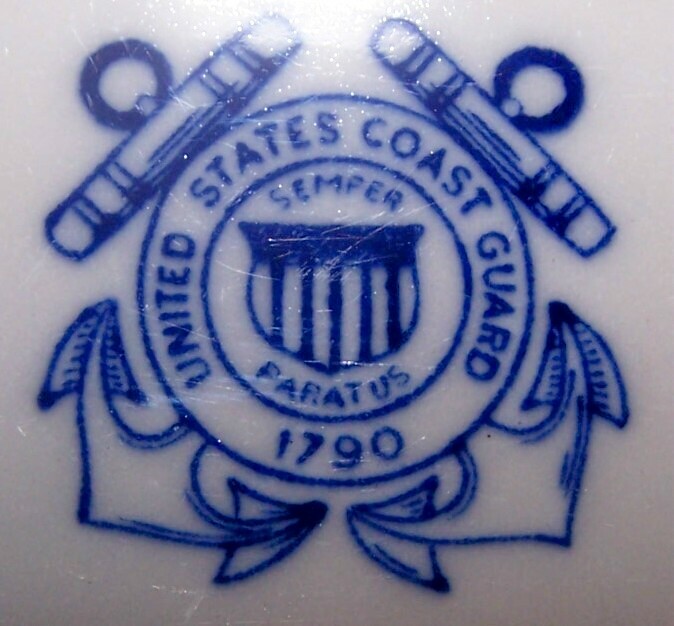 Made of heavy white institutional type china, dish is of the earlier pattern with the United States Coast Guard emblem in blue with crossed anchors surrounding Coast Guard shield, no stripes on rim. 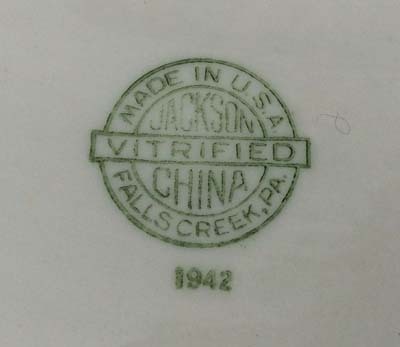 Bottom labeled "Jackson Vitrified China Made in U.S.A. Falls Creek, Pa. 1942". Attractive dish measures 5 ¼” in diameter. With little if any wear, clean, free of any cracks or major defects, scarce piece. (VG+). 2 available. $44 each. 8341-98. [dish or bowl] United States Coast Guard. Scarce original early United States Coast Guard small dish or bowl manufactured in the early years of the Twentieth Century for use in ships’ wardrooms and at some ‘stag’ stations. 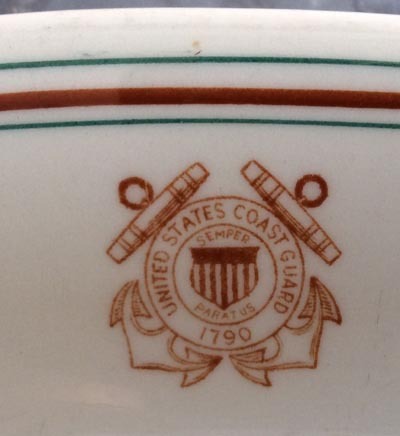 Made of heavy white institutional type china, dish is of the earlier pattern with the United States Coast Guard emblem in blue with crossed anchors surrounding Coast Guard shield, no stripes on rim. 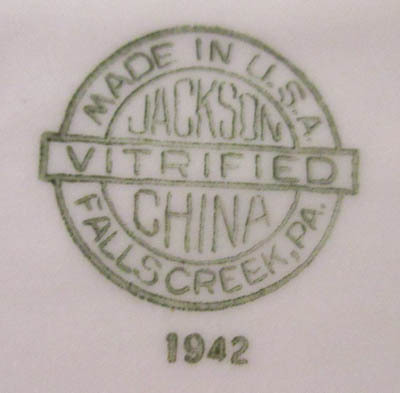 Bottom labeled "Jackson Vitrified China Made in U.S.A. Falls Creek, Pa. 1942". Attractive dish measures 7” in diameter. With little if any wear, clean, free of any cracks or major defects, scarce piece. (VG+). $54. 8341-102. [dinner plate] United States Coast Guard. 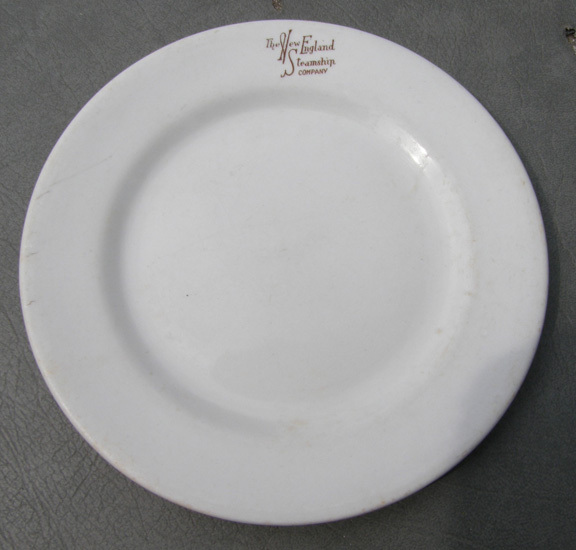 Scarce original early United States Coast Guard dinner plate manufactured in the early years of the Twentieth Century for use in ships’ wardrooms and at some ‘stag’ stations. 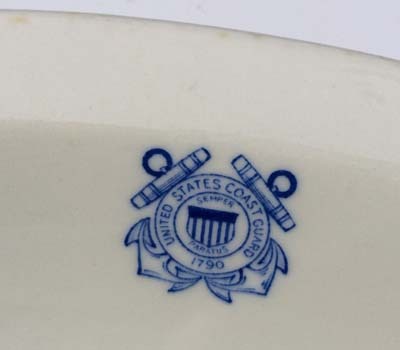 Made of heavy white institutional type china, dish is of the earlier pattern with the United States Coast Guard emblem in blue with crossed anchors surrounding Coast Guard shield, no stripes on rim. 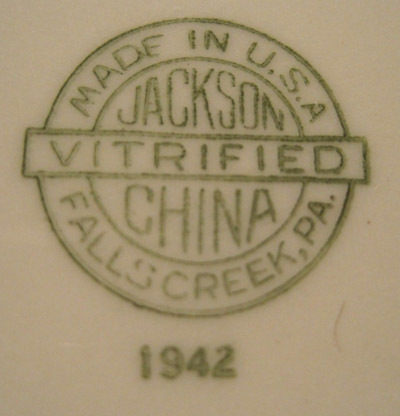 Bottom labeled "Jackson Vitrified China Made in U.S.A. Falls Creek, Pa. 1942". Attractive plate measures 9 5/8” in diameter. With little if any wear, clean, free of any cracks or major defects, scarce piece. (VG+). 2 available. $74 each. 8341-89. [serving bowl] United States Coast Guard c.1940’s. 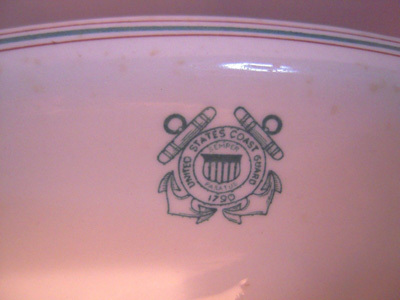 Scarce original early United States Coast Guard serving bowl manufactured in the early years of the Twentieth Century for use in ships’ wardrooms and at some ‘stag’ stations. 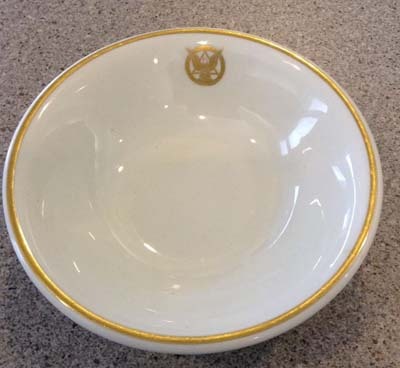 Made of heavy white institutional type china, bowl is of the earlier pattern with the United States Coast Guard emblem in blue with crossed anchors surrounding Coast Guard shield, no stripes on rim. 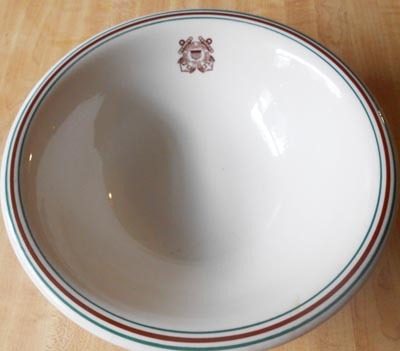 Bottom labeled "Jackson China Vitrified Made in U.S.A. Falls Creek, Pa. 1942” Attractive bowl measures 12” x 9” oval. Only very light wear, clean, free of any cracks or major defects, scarce piece. (VG+). $110. 8341yy. [Platter] United States Coast Guard. Bottom labeled “Nathan Straus & Sons , New York ”. Large platter measures 10” x 15”. With only very light wear, exceptionally clean and bright, free of any cracks or major defects, beautiful piece. (F-). $178 net. 8341aaa. [serving bowl] United States Coast Guard. 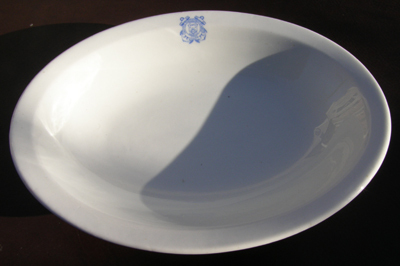 Scarce original early United States Coast Guard meat serving bowl manufactured in the early years of the Twentieth Century for use in ships’ wardrooms and at some ‘stag’ stations. Made of heavy white institutional type china. 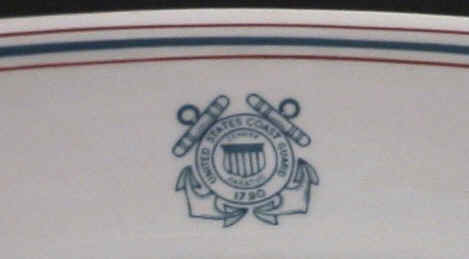 Bowl is of the earlier pattern with the United States Coast Guard emblem in blue with crossed anchors surrounding Coast Guard shield, no stripes on rim. Bottom labeled "Jackson China Marine Works New York". Large bowl measures 10" x 8" oval. With only light wear, clean and bright, free of any cracks or major defects. (VG+). $118. 8341uuu. [gravy boat] United States Coast Guard. Bottom labeled “Nathan Straus & Sons, New York”. This pattern is an intermediate pattern which includes one turquoise stripe around the perimeter bordered by two thin brown stripes. Below the stripe are the United States Coast Guard emblem in turquoise with crossed anchors surrounding Coast Guard shield. Large bright gravy boat measures 8 ¾” long by 4 ¾” high. With little if any wear, piece is exceptionally clean and bright, free of any cracks or major defects, beautiful piece. As nice as they come. (F). $118 net. 8341zz. [Bowl] United States Coast Guard. 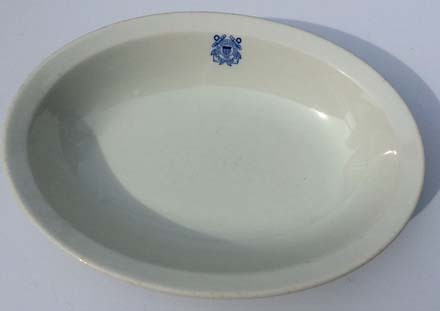 Scarce original early United States Coast Guard bowl or butter dish manufactured in the early years of the Twentieth Century for use in ships’ wardrooms and at some ‘stag’ stations. 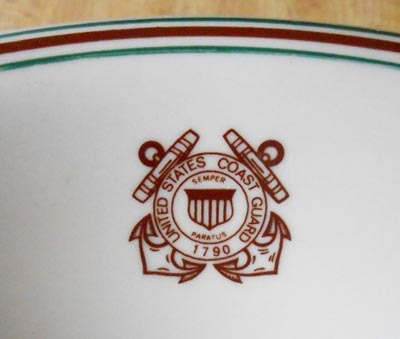 Made of heavy white institutional type china, bowl is of the earlier pattern with the United States Coast Guard emblem in blue with crossed anchors surrounding Coast Guard shield, no stripes on rim. Bottom labeled "Jackson China Marine Works New York". Attractive bowl measures 5 ¾" in diameter. With light wear, clean, free of any cracks or major defects, scarce piece. (VG). $78 net. This pattern is an intermediate pattern which includes one turquoise stripe around the perimeter bordered by two thin brown stripes. Below the stripe are the United States Coast Guard emblem in turquoise with crossed anchors surrounding Coast Guard shield. 8341-19. [demitasse cup] United States Coast Guard. 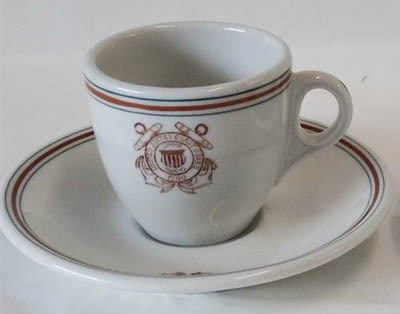 Scarce original early pattern United States Coast Guard demitasse cup manufactured in the early years of the Twentieth Century for use in ships’ wardrooms and at some ‘stag’ stations. Made of heavy white institutional type china, cup is of the scarce earlier pattern which includes one turquoise stripe around the perimeter bordered by two thin brown stripes. Below the stripe are the United States Coast Guard emblem in turquoise with crossed anchors surrounding Coast Guard shield. Bottom labeled “Walker China, Vitrified Bedford, Ohio A-49”. Cup measures 2 ½” diameter 2 ¼” high. With only very light wear, this is a rare, beautiful piece. We have had very few pieces in this color pattern over the years, making this quite worthwhile. (VG+). $114. 8341-26. 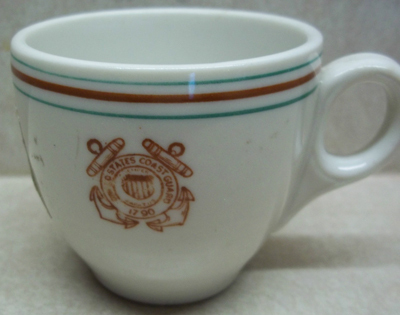 [demitasse cup] United States Coast Guard c.1920. 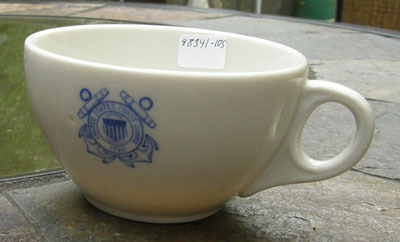 Scarce original early pattern United States Coast Guard demitasse cup manufactured in the early years of the Twentieth Century for use in ships’ wardrooms and at some ‘stag’ stations. Made of heavy white institutional type china, cup is of the scarce earlier pattern which includes one turquoise stripe around the perimeter bordered by two thin brown stripes. Below the stripe are the United States Coast Guard emblem in turquoise with crossed anchors surrounding Coast Guard shield. Bottom labeled “Jackson Vitrified China”. Cup measures 2 ½” diameter 2 ¼” high. With little if any wear, this is a rare, beautiful piece. We have had very few pieces in this color pattern over the years, making this quite worthwhile. (F-). $124. 8341-60. [saucer] United States Coast Guard c.1946. Scarce original early pattern United States Coast Guard saucer manufactured in the early years of the Twentieth Century for use in ships’ wardrooms and at some ‘stag’ stations. Made of heavy white institutional type china, saucer is of the scarce earlier pattern which includes one turquoise stripe around the perimeter bordered by two thin brown stripes. Below the stripe are the United States Coast Guard emblem in turquoise with crossed anchors surrounding Coast Guard shield. 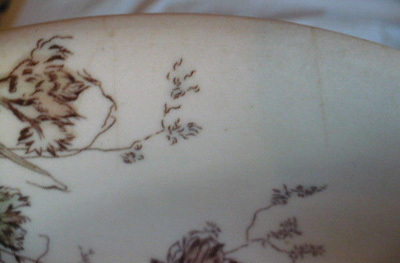 Bottom labeled “Jackson China 1946”. Saucer measures 6 ¼” in diameter. With light wear, this is a rare, beautiful piece. We have had very few pieces in this color pattern over the years, making this quite worthwhile. (VG). $110. 8341-83. [bullion cup] United States Coast Guard. 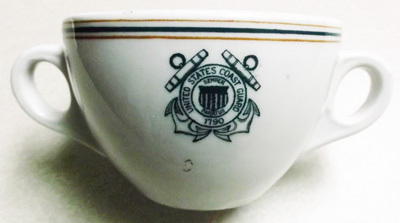 Scarce original early pattern United States Coast Guard bullion cup manufactured in the early years of the Twentieth Century for use in ships’ wardrooms and at some ‘stag’ stations. Made of heavy white institutional type china, cup is of the scarce earlier pattern which includes one turquoise stripe around the perimeter bordered by two thin brown stripes. Below the stripe are the United States Coast Guard emblem in turquoise with crossed anchors surrounding Coast Guard shield. 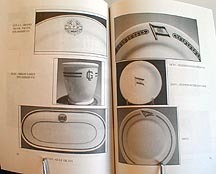 Bottom labeled “Jackson China, Marine Works New York”. Cup measures 3 ¾” in diameter 2 ½” high. With only light wear, this is a rare, beautiful piece. We have had very few pieces in this color pattern over the years, making this quite worthwhile. (VG+). $124. 8341-84. [serving bowl] United States Coast Guard. 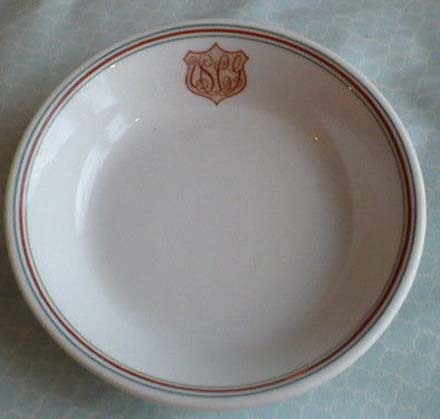 Scarce original early pattern United States Coast Guard serving bowl manufactured in the early years of the Twentieth Century for use in ships’ wardrooms and at some ‘stag’ stations. Made of heavy white institutional type china, bowl is of the scarce earlier pattern which includes one turquoise stripe around the perimeter bordered by two thin brown stripes. Below the stripe are the United States Coast Guard emblem in turquoise with crossed anchors surrounding Coast Guard shield. Bottom labeled “Walker China, Vitrified Bedford Ohio 44”. Bowl measures 12” x 9 ½” oval. With light wear to rim and one 1 ¼” closed crack on rim. This is a rare pattern and a pretty piece. We have had very few pieces in this color pattern over the years, making this quite worthwhile. (VG-). $124. 8341fff. [platter] United States Coast Guard. Scarce original early pattern United States Coast Guard meat platter manufactured in the early years of the Twentieth Century for use in ships’ wardrooms and at some ‘stag’ stations. Made of heavy white institutional type china. Platter is of the scarce earlier pattern which includes one turquoise stripe around the perimeter bordered by two thin brown stripes. Below the stripe are the United States Coast Guard emblem in turquoise with crossed anchors surrounding Coast Guard shield. Bottom labeled “Walker China, Bedford, Ohio”. Extremely large platter measures 12” x 17 ½” . With only very light wear, light to moderate crazing from age and some browning in areas, this is still a rare, beautiful piece. We have had very few pieces in this color pattern over the years, making this quite worthwhile. (VG-). $158 net. This pattern is a later pattern which includes one brown stripe around the perimeter bordered by two thin turquoise stripes. Within the stripe are the United States Coast Guard emblem with brown crossed anchors surrounding Coast Guard shield. 8341-74, 77, 78. 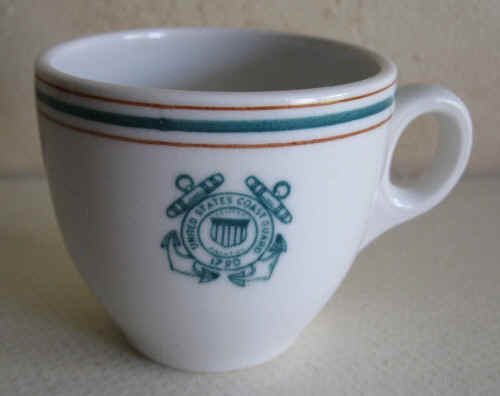 [demitasse cup] United States Coast Guard. Bottom labeled “Bailey Walker Vitrified China Bedford, Ohio 1943”. This pattern is a later pattern which includes one brown stripe around the perimeter bordered by two thin turquoise stripes. Within the stripe are the United States Coast Guard emblem with brown crossed anchors surrounding Coast Guard shield. Cup measures 2 ½” diameter, 2 ¼” high. Little if any wear. (VG+). $54 each. 8341-76. [demitasse cup] United States Coast Guard. Bottom labeled “Jackson China Falls Creek Pa 66”. This pattern is a later pattern which includes one brown stripe around the perimeter bordered by two thin turquoise stripes. Within the stripe are the United States Coast Guard emblem with brown crossed anchors surrounding Coast Guard shield. Cup measures 2 ½” diameter, 2 ¼” high. Little if any wear. (VG+). $54. 8341-93. (demitasse cup/saucer) United States Coast Guard. Bottom labeled “Walker Vitrified China Bedford, Ohio 44”. This pattern is a later pattern which includes one brown stripe around the perimeter bordered by two thin turquoise stripes. Within the stripe are the United States Coast Guard emblem with brown crossed anchors surrounding Coast Guard shield. Cup measures 2 ½” diameter, 2 ¼” high, saucer 5” diameter. Little if any wear. (F-). Set $74. 8341-94. (demitasse cup/saucer) United States Coast Guard. Bottom labeled: [saucer] “Walker Vitrified China Bedford, Ohio 44” [cup] “Bailey Walker Vitrified China Bedford, Ohio 1943”. This pattern is a later pattern which includes one brown stripe around the perimeter bordered by two thin turquoise stripes. Within the stripe are the United States Coast Guard emblem with brown crossed anchors surrounding Coast Guard shield. Cup measures 2 ½” diameter, 2 ¼” high, saucer 5” diameter. Little if any wear. (F-). Set $74. 8341-85. (demitasse cup/saucer) United States Coast Guard. Bottom labeled “Bailey Walker Vitrified China Bedford, Ohio 1942 ”This pattern is a later pattern which includes one brown stripe around the perimeter bordered by two thin turquoise stripes. Within the stripe are the United States Coast Guard emblem with brown crossed anchors surrounding Coast Guard shield. Cup measures 2 ½” diameter, 2 ¼” high, saucer 5” diameter. Little if any wear. (F-). Set $84. 8341-56. [bread plate] United States Coast Guard. Bottom labeled “Jackson Custom China Falls Creek, PA. USA H12”. This pattern is a later pattern which includes one brown stripe around the perimeter bordered by two thin turquoise stripes. Within the stripe are the United States Coast Guard emblem with brown crossed anchors surrounding Coast Guard shield. 7 1/8” diameter. Little if any wear. (F-). $36. 8341-58. [bread plate] United States Coast Guard. Bottom labeled “Jackson Custom China Falls Creek, PA. USA H12”. This pattern is a later pattern which includes one brown stripe around the perimeter bordered by two thin turquoise stripes. Within the stripe are the United States Coast Guard emblem with brown crossed anchors surrounding Coast Guard shield. 7 1/8” diameter. Little if any wear. (F-). $36. 8341-57. [dinner plate] United States Coast Guard. Bottom labeled “Mayer China Beaver Falls U.S.A. 284”. This pattern is a later pattern which includes one brown stripe around the perimeter bordered by two thin turquoise stripes. Within the stripe are the United States Coast Guard emblem with brown crossed anchors surrounding Coast Guard shield. 8 7/8” diameter. Only very light wear. (VG+). $48. 8341-63. [cup] United States Coast Guard. Bottom labeled “Walker China Vitrified Bedford Ohio 1956”. This pattern is a later pattern which includes one brown stripe around the perimeter bordered by two thin turquoise stripes. Within the stripe are the United States Coast Guard emblem with brown crossed anchors surrounding Coast Guard shield. Cup measures 3 7/8” diameter, 2 ¼” high. Little if any wear. (F-). $52. 8341-64. [cup] United States Coast Guard. Bottom labeled “Mayer China Vitrified Beaver Falls, PA. U.S.A. 264”. This pattern is a later pattern which includes one brown stripe around the perimeter bordered by two thin turquoise stripes. Within the stripe are the United States Coast Guard emblem with brown crossed anchors surrounding Coast Guard shield. Cup measures 3 7/8” diameter, 2 ¼” high. Little if any wear. (F-). $52. 8341-40. [bread plate] United States Coast Guard. 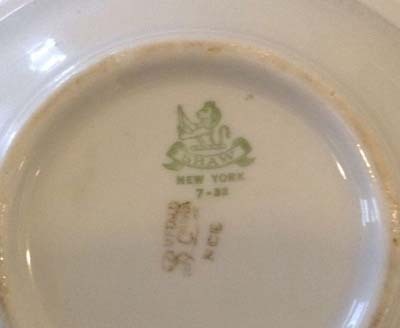 Bottom labeled “Syracuse China USA Since 1871 32-A”. This pattern is a later pattern which includes one brown stripe around the perimeter bordered by two thin turquoise stripes. Within the stripe are the United States Coast Guard emblem with brown crossed anchors surrounding Coast Guard shield. 7 ¼” diameter. Little if any wear. (F-). $34. 8341-35. [bread plate] United States Coast Guard. Bottom labeled “Walker China Vitrified Bedford Ohio. 1955”. This pattern is a later pattern which includes one brown stripe around the perimeter bordered by two thin turquoise stripes. Within the stripe are the United States Coast Guard emblem with brown crossed anchors surrounding Coast Guard shield. 7 ¼” diameter. Little if any wear. (VG+). $34. 8341-37. [small bread plate] United States Coast Guard. Bottom labeled “Walker China Vitrified Bedford Ohio. 1962”. This pattern is a later pattern which includes one brown stripe around the perimeter bordered by two thin turquoise stripes. Within the stripe are the United States Coast Guard emblem with brown crossed anchors surrounding Coast Guard shield. 6 3/8” diameter. Little if any wear. (VG+). $34. 8341-41. [small bread plate] United States Coast Guard. Bottom labeled “Mayer China Beaver Falls, PA. by Interpace USA 372”. This pattern is a later pattern which includes one brown stripe around the perimeter bordered by two thin turquoise stripes. Within the stripe are the United States Coast Guard emblem with brown crossed anchors surrounding Coast Guard shield. 6 3/8” diameter. Little if any wear. (F-). $34. 8341-49. [demitasse cup] United States Coast Guard. Bottom labeled “Walker China Bedford, Ohio 3-44”. This pattern is a later pattern which includes one brown stripe around the perimeter bordered by two thin turquoise stripes. Within the stripe are the United States Coast Guard emblem with brown crossed anchors surrounding Coast Guard shield. Cup measures 2 ½” diameter, 2 ¼” high. As new, little if any wear. (F-). $54. 8341-81. [deep serving bowl] United States Coast Guard. Bottom labeled “Jackson Custom China Falls Creek, Pa. USA H11”. This pattern is a later pattern which includes one brown stripe around the perimeter bordered by two thin turquoise stripes. Within the stripe are the United States Coast Guard emblem with brown crossed anchors surrounding Coast Guard shield. Bowl measures 8 ¼” in diameter and 3 ¼” high. Little if any wear, as new. (F-). $128. 8341-82. [platter] United States Coast Guard. Bottom labeled “Nathan Straus & Sons, New York”. This pattern is a later pattern which includes one brown stripe around the perimeter bordered by two thin turquoise stripes. Within the stripe are the United States Coast Guard emblem with brown crossed anchors surrounding Coast Guard shield. Platter measures 17” by 11 3/8” oval. Little if any wear. Earlier piece in this pattern. (VG+). $148. 8341-43. [cup] United States Coast Guard. Bottom labeled “Walker China Vitrified Bedford, Ohio 1955”. This pattern is a later pattern which includes one brown stripe around the perimeter bordered by two thin turquoise stripes. Within the stripe are the United States Coast Guard emblem with brown crossed anchors surrounding Coast Guard shield. Cup measures 3 7/8” diameter, 2 ¼” high. As new, little if any wear. (F-). $58. 8341-53. [cup] United States Coast Guard. Bottom labeled “Walker China Vitrified Bedford, Ohio 1964”. This pattern is a later pattern which includes one brown stripe around the perimeter bordered by two thin turquoise stripes. Within the stripe are the United States Coast Guard emblem with brown crossed anchors surrounding Coast Guard shield. Cup measures 3 7/8” diameter, 2 ¼” high. As new, little if any wear. (F-). $58. 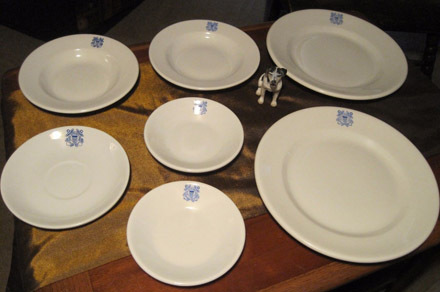 These are a scarce original china dinnerware pieces from the United States Revenue Cutter Service manufactured of heavy white institutional type china, in the latter years of the Nineteenth Century and early years of the Twentieth Century for use in ships’ wardrooms. This pattern is in rust, brown, green and blue, and consists of a floral pattern around the rim. In the center of the rim is the United States Revenue Cutter emblem in rust with crossed anchors behind. 8341-103. (serving bowl) United States Revenue Cutter Service Serving Bowl c.1886-1910. Scarce, original United States Revenue Cutter Service serving bowl in the rust colored “U.S.R.C.S.” flower pattern. This is a scarce original china dinnerware piece from the United States Revenue Cutter Service manufactured of heavy white institutional type china, in the latter years of the Nineteenth Century and early years of the Twentieth Century for use in ships’ wardrooms. Bowl is large and bold, quite attractive, with little if any expected wear. There are two closed age lines on one side but do not detract. This pattern is in rust, brown, and green, and consists of a floral pattern around the rim. In the center of the rim is the United States Revenue Cutter emblem in rust with crossed anchors behind. Dish is back-marked “Greenwood China, Trenton, N.J.” and date stamped “Greenwood China P” indicating a date range of 1886-1910. Dish is oval, and measures 8 1/8” x 10 ½” x 2 ¼” high. In wonderful condition, an exceptionally rare find. $425. 20238e,f. 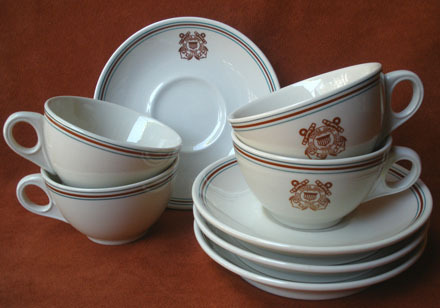 United States Revenue Cutter Service “U.S.R.C.S.” Dinnerware. Scarce, original United States Revenue Cutter Service saucer in the rust, blue/gray and pink “U.S.R.C.S.” flower pattern. Dish is quite attractive, with little if any expected light wear, free of any cracks or major defects. Dish is back-marked “ZZ” and imprinted with " Greenwood China , Trenton N.J. ” This mark dates to 1886-1910. There are no other markings visible. Saucer is complete, no chips, with only very light expected wear. In wonderful condition, round, and measures 4 7/8” . (VG+). $328 net. 20238g. [same]. c. 1886-1910. Saucer is complete but with two chips on the underside. Not visible from the top, with only very light expected wear. 4 7/8” . (VG-). $288 net. 8341-16, 17. 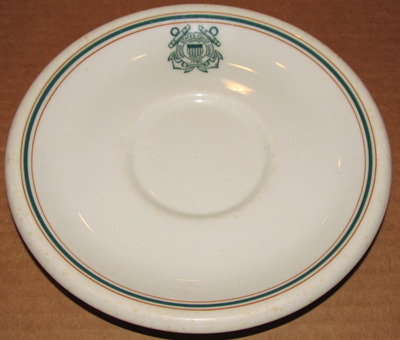 (bone dish) United States Revenue Cutter Service Dinnerware. 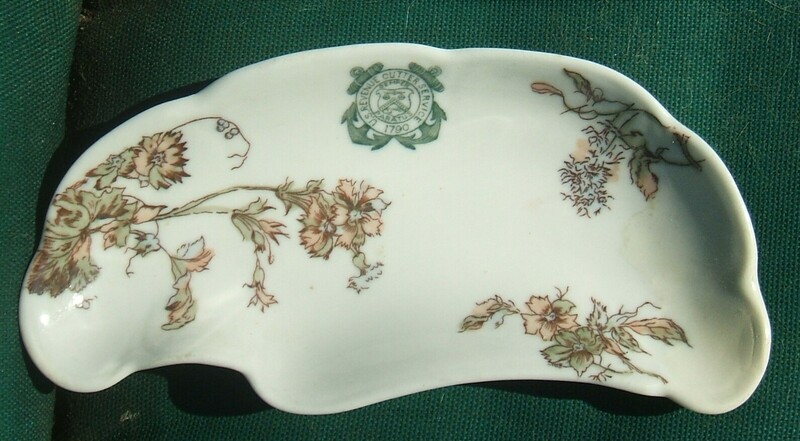 Scarce, original United States Revenue Cutter Service bread or bone dish in the rust colored “U.S.R.C.S.” flower pattern. This is a scarce original china dinnerware piece from the United States Revenue Cutter Service manufactured of heavy white institutional type china, in the latter years of the Nineteenth Century and early years of the Twentieth Century for use in ships’ wardrooms. Dish is quite attractive, with little if any expected light wear, free of any cracks or major defects. 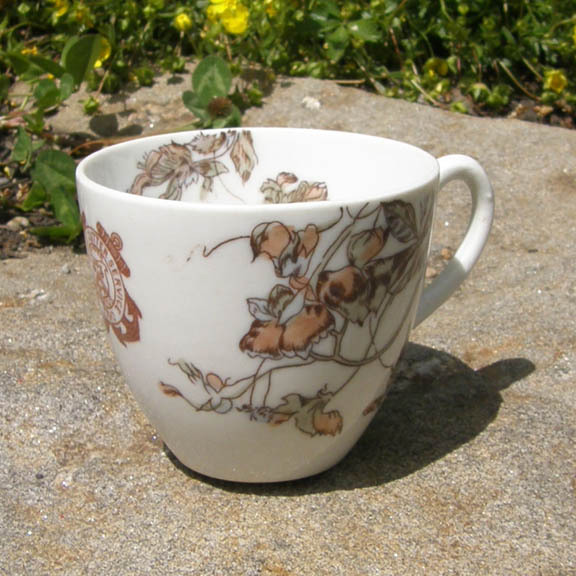 This pattern is in rust, brown, and green, and consists of a floral pattern around the rim. In the center of the rim is the United States Revenue Cutter emblem in rust with crossed anchors behind. Dish is back-marked “Greenwood China, Trenton, N.J. Dish is complete, no chips, with little if any wear. In wonderful condition. Dish is oval, and measures 6 5/8” x 3 ¼”. $268 each. (4 available). 8341-7. 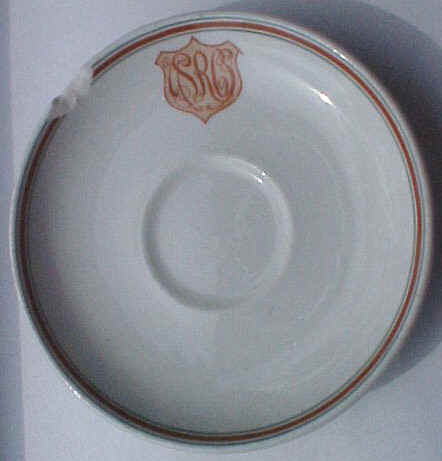 United States Revenue Cutter Service “U.S.R.C.S.” Dinnerware. Scarce, original United States Revenue Cutter Service demitasse cup in the rust, blue/gray and pink “U.S. Revenue Cutter Service” flower pattern. Cup is back-marked “Z” and may have been manufactured by Greenwood China Company, Trenton N.J. There are no other markings visible. Cup is quite attractive and is complete, no chips, with little if any expected wear. In wonderful condition, measures 2 ¼” high. (VG+). $366 net. 8341-8,9. 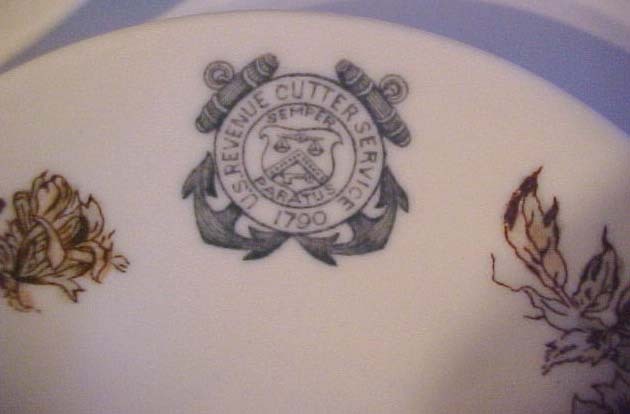 United States Revenue Cutter Service “U.S.R.C.S.” Dinnerware. Scarce, original United States Revenue Cutter Service demitasse cup in the rust, blue/gray and pink “U.S. Revenue Cutter Service” flower pattern. Cup is back-marked “Z” and may have been manufactured by Greenwood China Company, Trenton N.J. There are no other markings visible. Cup is quite attractive and is complete, no chips but one closed crack to the handle, otherwise with little if any expected wear. A wonderful piece, measures 2 ¼” high. (VG-). $286 net. This pattern is one of the two the later pattern used just before the service was combined with the Life Saving Service to form the Coast Guard. The pattern is done in rust and green, and consists of one green stripe around the perimeter bordered by two thin rust stripes. Beneath, in a green shield, are the letters “USRCS” in an intertwining pattern. This pattern would be continued into the early Coast Guard with only the letters changed to “USCG”. 8341ggg. 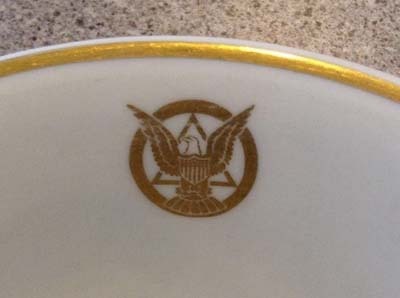 United States Revenue Cutter Service “U.S.R.C.S.” Dinnerware. Scarce, original United States Revenue Cutter Service large meat platter in the rare later intertwined “U.S.R.C.S.” pattern. Platter is quite attractive, with little if any expected light wear, free of any cracks or major defects. Dish is back-marked “M China L”. There are no other markings visible. Platter is complete, no chips, with only light expected wear, in wonderful condition. Platter is oval, and measures 17 5/8” by 12 ¾” . An extremely rare piece and pattern. (VG). $725 net. 8341hhh. 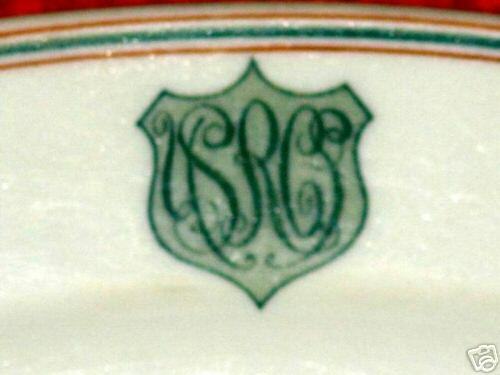 United States Revenue Cutter Service “U.S.R.C.S.” Dinnerware. 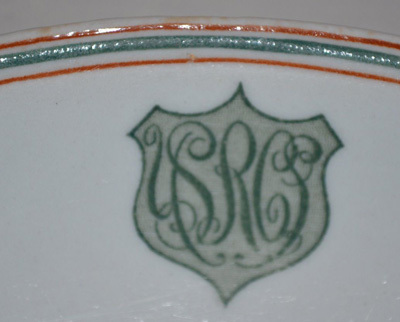 Scarce, original United States Revenue Cutter Service bread plate in the rare later intertwined “U.S.R.C.S.” pattern. Plate is back-marked “M China L”. There are no other markings visible. 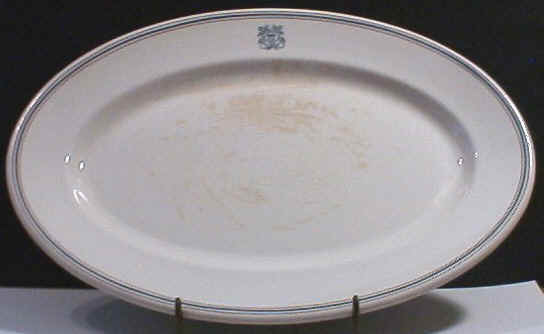 Plate has one large 3/4" chip from under the rim but not visible from the top, and is otherwise quite clean and presentable. Plate measures 7 5/8” in diameter. An affordable alternative of this extremely rare pattern. (VG-). $285 net. 20238h. 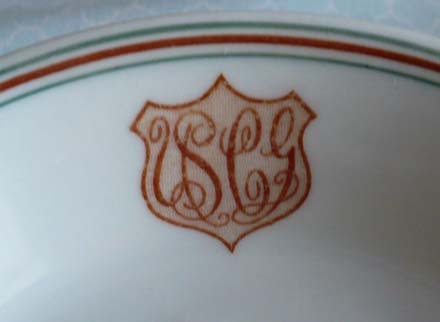 United States Revenue Cutter Service “U.S.R.C.S.” Dinnerware. 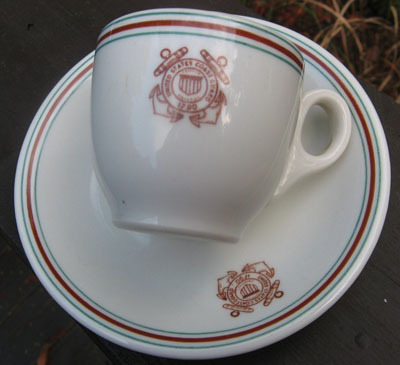 Scarce, original United States Revenue Cutter Service cup / saucer set in the rare later intertwined “U.S.R.C.S.” pattern. 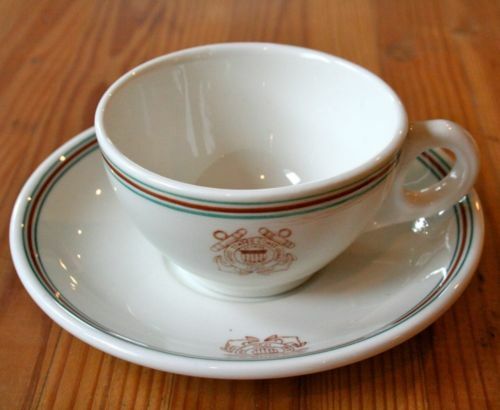 Demi cup and saucer are quite attractive, with little if any expected light wear, free of any cracks or major defects. Pieces are back-marked “M China L”. There are no other markings visible. Both pieces are in superb condition, complete, no chips, with very little if any expected wear. In wonderful condition. Demi cup measures 2 ½” in diameter by 2 ¼” high. Saucer measures 4 5/8” in diameter. An extremely rare pattern. (VG+). $688 net. 8341-86. 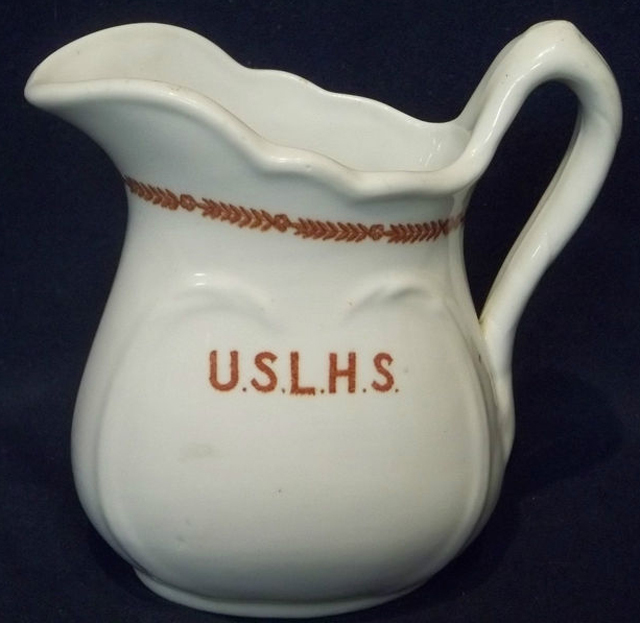 [condiment dish] United States Revenue Cutter Service “U.S.R.C.S.” c.1900. Dinnerware. 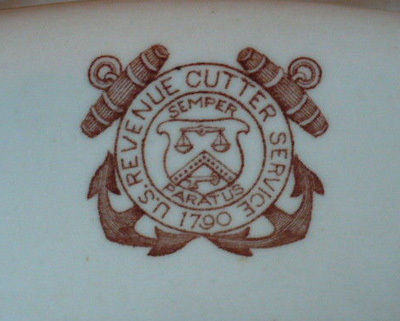 Scarce, original United States Revenue Cutter Service condiment dish in the rare later intertwined “U.S.R.C.S.” pattern. This pattern is one of the two the later pattern used just before the service was combined with the Life Saving Service to form the Coast Guard. The pattern is done in rust and green, and consists of one green stripe around the perimeter bordered by two thin rust stripes. Beneath, in a green shield, are the letters “USRCS” in an intertwining pattern. This pattern would be continued into the early Coast Guard with only the letters changed to “USCG”. Dish is quite attractive, with a bit of edge wear and a few spots on the rim, but free of any cracks or major defects. Piece is back-marked “M China L”. There are no other markings visible. 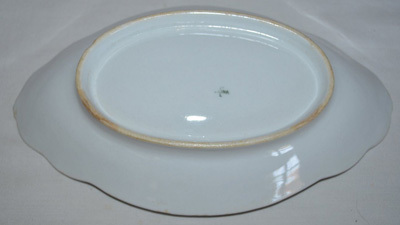 Dish measures 8 ½” by 5” oval. An extremely rare pattern. (VG). $685. 8341qqq. (platter) United States Revenue Cutter Service “U.S.R.C.S.” Dinnerware. 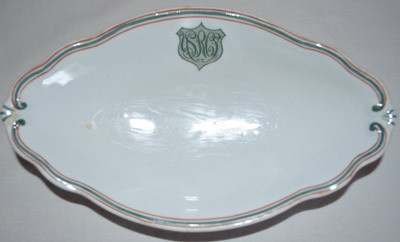 Scarce, original United States Revenue Cutter Service medium meat platter in the rare later intertwined “U.S.R.C.S.” pattern. Platter is quite attractive, with little if any expected light wear, free of any cracks or major defects. Dish is back-marked “M China L”. There are no other markings visible. Platter is complete, no chips, with only very light if any expected wear, in wonderful condition. Platter is oval, and measures 12 3/8” by 8 5/8” . An extremely rare piece and pattern. (VG+). $725 net. 8341ggg. 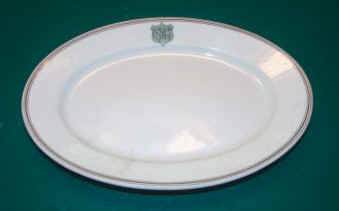 (platter) United States Revenue Cutter Service “U.S.R.C.S.” Dinnerware. 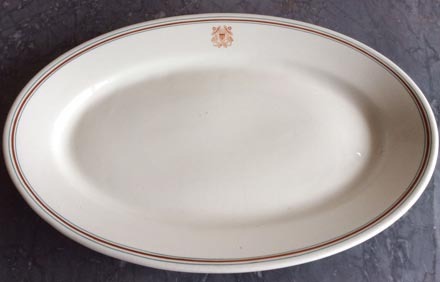 Scarce, original United States Revenue Cutter Service large meat platter in the rare later intertwined “U.S.R.C.S.” pattern. Platter is quite attractive, with little if any expected light wear, free of any cracks or major defects. Dish is back-marked “M China L”. There are no other markings visible. Platter is complete, no chips, with only light expected wear, in wonderful condition. Platter is oval, and measures 17 5/8” by 12 ¾” . An extremely rare piece and pattern. (VG). $725 net. 8341hhh. 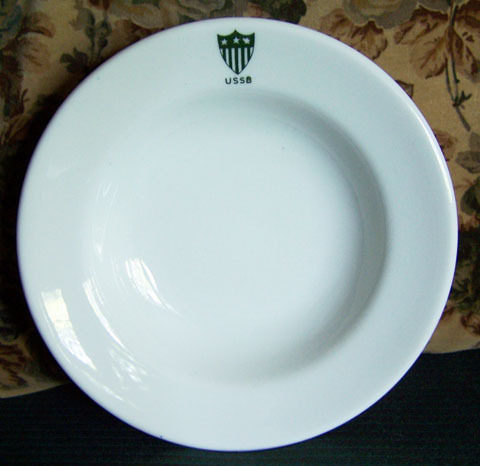 (bread plate) United States Revenue Cutter Service “U.S.R.C.S.” Dinnerware. 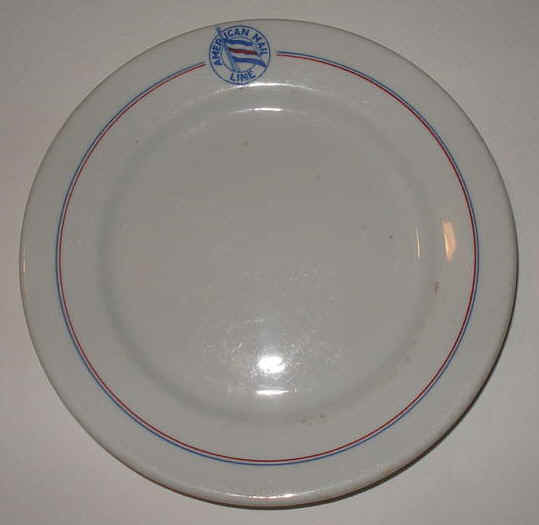 Scarce, original United States Revenue Cutter Service bread plate in the rare later intertwined “U.S.R.C.S.” pattern. Plate is back-marked “M China L”. There are no other markings visible. 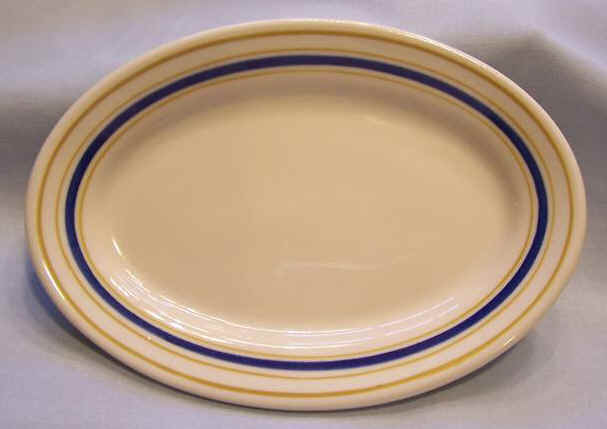 Plate has one large 3/4" chip from under the rim but not visible from the top, and is otherwise quite clean and presentable. Plate measures 7 5/8” in diameter. An affordable alternative of this extremely rare pattern. (VG-). $285 net. 20238h. 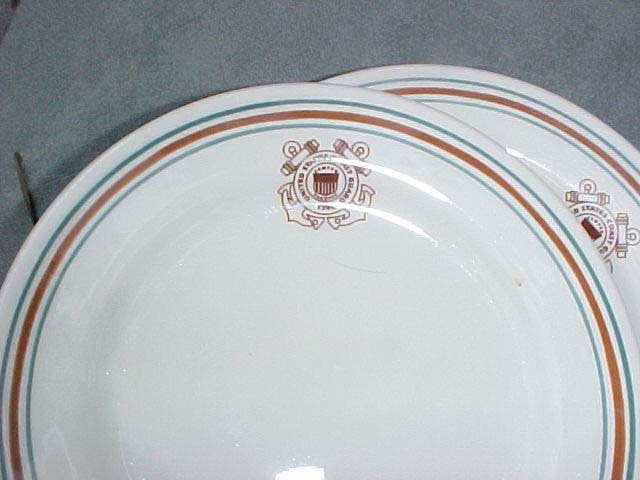 United States Revenue Cutter Service “U.S.R.C.S.” Dinnerware. 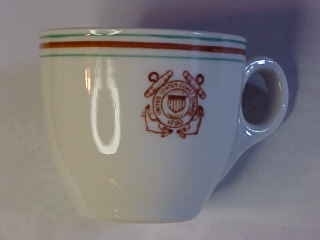 Scarce, original United States Revenue Cutter Service cup / saucer set in the rare later intertwined “U.S.R.C.S.” pattern. 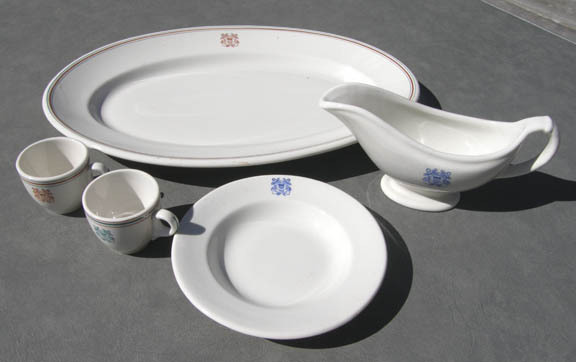 This is a scarce original china dinnerware set from the United States Revenue Cutter Service manufactured of heavy white institutional type china, in the latter years of the Nineteenth Century and early years of the Twentieth Century for use in ships’ wardrooms. Demi cup and saucer are quite attractive, with little if any expected light wear, free of any cracks or major defects. This pattern is the later pattern used just before the service was combined with the Life Saving Service to form the Coast Guard. The pattern is done in rust and brown, and consists of one green stripe around the perimeter bordered by two thin rust stripes. Beneath, in a green shield, are the letters “USRCS” in an intertwining pattern. This pattern would be continued into the early Coast Guard with only the letters changed to “USCG”. Dish is back-marked “M China L”. There are no other markings visible. Both pieces are in superb condition, complete, no chips, with very little if any expected wear. In wonderful condition. Demi cup measures 2 ½” in diameter by 2 ¼” high. Saucer measures 4 5/8” in diameter. An extremely rare pattern. (VG+). $688 net. 8341-95. 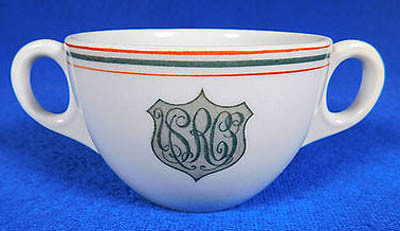 [bullion cup] United States Revenue Cutter Service “U.S.R.C.S.” c.1900. 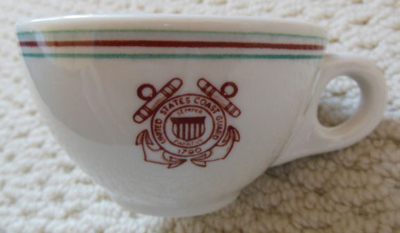 Scarce, original United States Revenue Cutter Service bullion cup in the rare later intertwined “U.S.R.C.S.” pattern. This pattern is one of the two the later pattern used just before the service was combined with the Life Saving Service to form the Coast Guard. The pattern is done in rust and green, and consists of one green stripe around the perimeter bordered by two thin rust stripes. Beneath, in a green shield, are the letters “USRCS” in an intertwining pattern. This pattern would be continued into the early Coast Guard with only the letters changed to “USCG”. Cup is quite attractive, with little if any expected wear. Piece is back-marked “M China L” ( Maddocks Lamberton China Co. ). There are no other markings visible. Piece is in superb condition, complete, no chips, in wonderful condition. Cup measures about 5 ½” wide, 2 3/8” high. An extremely rare pattern. (F-). $445. 20238j. 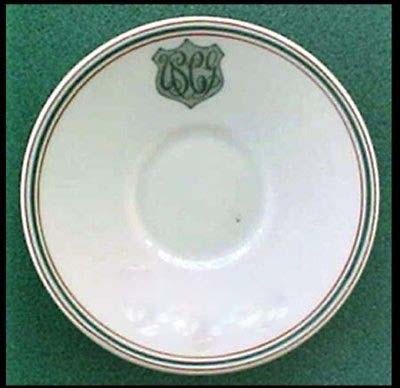 United States Revenue Cutter Service “U.S.R.C.S.” Dinnerware. Scarce, original United States Revenue Cutter Service saucer in the rare later intertwined “U.S.R.C.S.” pattern. This is a scarce original china dinnerware piece from the United States Revenue Cutter Service manufactured of heavy white institutional type china, in the latter years of the Nineteenth Century and early years of the Twentieth Century for use in ships’ wardrooms. This pattern is the later pattern used just before the service was combined with the Life Saving Service to form the Coast Guard. The pattern is done in rust and brown, and consists of one green stripe around the perimeter bordered by two thin rust stripes. Beneath, in a green shield, are the letters “USRCS” in an intertwining pattern. This pattern would be continued into the early Coast Guard with only the letters changed to “USCG”. 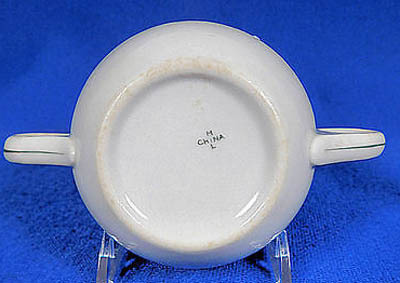 Saucer is back-marked “M China L”. There are no other markings visible. Saucer has one large 3/4" chip from rim but is otherwise clean and presentable. Saucer measures 4 5/8” in diameter. An affordable alternative of this extremely rare pattern. (VG+). $125 net. 22289. [ US Navy dinnerware] This is a wonderful eggcup (or custard) from the United States Navy dinnerware made by Tepco China of California . Tepco produced china for the Navy and the Army Medical Department during World War II. This very collectible Naval mess egg cup features the top-mark or emblem signifying the Chief Petty Officer, consisting of a deep blue line border, beneath which us a fouled anchor and the letters “U.S.N.” . Cup is 3 1/4" tall, 3 1/8" in diameter, and is in excellent condition with no chips, cracks, or crazing but does have some minor (but common) glazing flaws. This piece is marked with a green Tepco China U.S.A.” stamp. This great piece of Naval Mess porcelain is sure to compliment your collection of military items or war memorabilia. (VG+). $38. 2242. [butter dish] Canadian Coast Guard. Scarce original early Canadian Coast Guard butter dish manufactured in the mid Twentieth Century for use in ships’ wardrooms and at some stations. Of heavy white institutional type china. With only light wear, free of any cracks or major defects. Dish is of a blue stripe pattern with crown and oak leaf. Bottom labeled "Duraline Super Vitrified Grindley Hotelware Co., Made in England. 11-78". Measurements 5" diameter. Very difficult to find Canadian Coast Guard items. (VG+). $28. 13113. (demitasse cup) Grace Steamship Line. Measures 2 ¼” high 2 ¼” diameter. 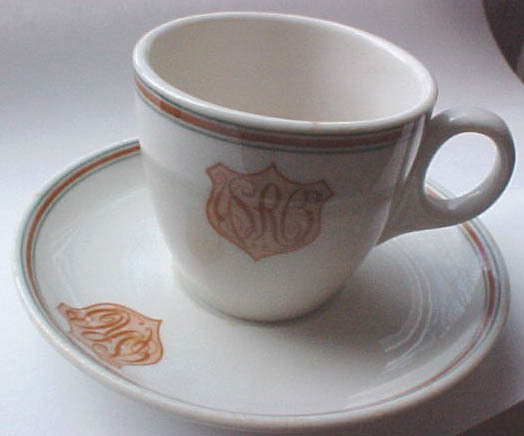 Rare little demitasse cup from the Grace Line (W. R. Grace & Co), New York (1882-69). What later became the Grace Line originated in 1882 as a line of sailing vessels between Peru and New York. US-flag service began in 1912 with the Atlantic and Pacific Steamship Company. The activities of both companies and the parent firm were consolidated into the Grace Steamship Company beginning in 1916. The firm originally specialized in traffic to the west coast of South America; then expanded into the Caribbean. After World War II. 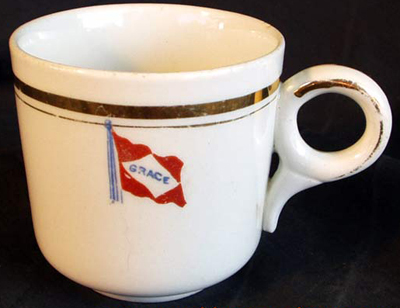 Cup bears the Grace Line flag - red with the word "GRACE" in blue on a white lozenge. Cup is enhanced with a gilt stripe around rim of cup and along handle. Only light wear to gilding on handle. A rare steamship collectible. (VG). $78. 12469b. 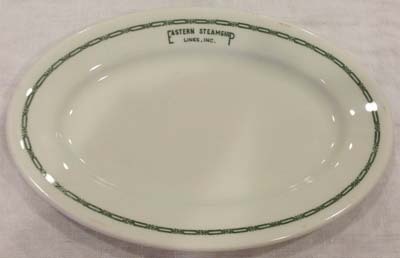 (small platter) Eastern Steamship Lines, Inc. c.1930’s. Lovely original Eastern Steamship Lines platter bears the company logo in Buffalo China’s green Ravenna pattern. This pattern pre-dated the Mayer's "Marine" “Eastern Blue” pattern used in the 1930’s. Platter is backmarked “Buffalo China AG” with green buffalo logo. Eastern Steamship Lines was in business from 1901 – 1954. In 1901 Charles W. Morse consolidated six New New England coastwise lines into Eastern Steamship Company, which after some financial trouble became Eastern Steamship Lines in 1911. During its heyday, Eastern Steamship Lines operated coastwise steamers from New York, via the Old Dominion Line, south to Virginia ports, and from Boston, via the Boston & Yarmouth Line, north to Maine, New Brunswick and Nova Scotian ports, and a service connecting New York & Boston. Notable ships included the Massachusetts, Bunker Hill, Old Colony, Boston, H. M. Whitney, James H. Whitney, Calvin Austin, Gov. Dingley, Gov. Cobb, Yarmouth, Evangeline, Saint John and Acadia. Platter measures 8 ½” x 5 ¾”. Little or no wear, clean, bright. (VG+). $74. 12469. 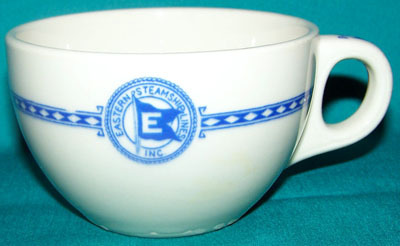 (cup) Eastern Steamship Lines, Inc. c.1930’s. Lovely original Eastern Steamship Lines cup bears the company logo in Mayer's "Marine" “Eastern Blue” pattern. This pattern followed the green Ravenna pattern used in the 1920’s. Cup is backmarked “Mayer China Est. 1881 Marine True Ivory” “18”. Eastern Steamship Lines was in business from 1901 – 1954. In 1901 Charles W. Morse consolidated six New New England coastwise lines into Eastern Steamship Company, which after some financial trouble became Eastern Steamship Lines in 1911. During its heyday, Eastern Steamship Lines operated coastwise steamers from New York, via the Old Dominion Line, south to Virginia ports, and from Boston, via the Boston & Yarmouth Line, north to Maine, New Brunswick and Nova Scotian ports, and a service connecting New York & Boston. Notable ships included the Massachusetts, Bunker Hill, Old Colony, Boston, H. M. Whitney, James H. Whitney, Calvin Austin, Gov. Dingley, Gov. Cobb, Yarmouth, Evangeline, Saint John and Acadia. Cup measures 3 ¾” diameter by 2 3/8” high. Little or no wear, clean, bright. (F-). $78. 12469c,d. 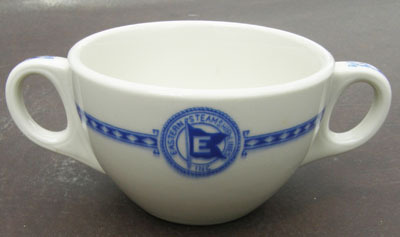 (bouillon cup) Eastern Steamship Lines, Inc. c.1930’s. Lovely original Eastern Steamship Lines two handle bouillon cup bears the company logo in Mayer's "Marine" “Eastern Blue” pattern. This pattern followed the green Ravenna pattern used in the 1920’s. Cup is backmarked “Mayer China Est. 1881 Marine True Ivory” “18”. Eastern Steamship Lines was in business from 1901 – 1954. In 1901 Charles W. Morse consolidated six New New England coastwise lines into Eastern Steamship Company, which after some financial trouble became Eastern Steamship Lines in 1911. During its heyday, Eastern Steamship Lines operated coastwise steamers from New York, via the Old Dominion Line, south to Virginia ports, and from Boston, via the Boston & Yarmouth Line, north to Maine, New Brunswick and Nova Scotian ports, and a service connecting New York & Boston. Notable ships included the Massachusetts, Bunker Hill, Old Colony, Boston, H. M. Whitney, James H. Whitney, Calvin Austin, Gov. Dingley, Gov. Cobb, Yarmouth, Evangeline, Saint John and Acadia. Cup measures 3 ¾” diameter by 2 3/8” high, 6” handle to handle. Little or no wear, clean, bright. Beautiful piece. (F-). $76. 10213d. (roll plate) New England Steamship Company. c.1920’s – 1940’s. Lovely original New England Steamship Company dinner plate bears the company name in brown, early pattern without border decoration. Manufactured by Nathan Straus Vitrified China. Plate measures 7 ¼” in diameter, and is clean with light wear. (VG). $82. 22575b. [bowl] United States Shipping Board. 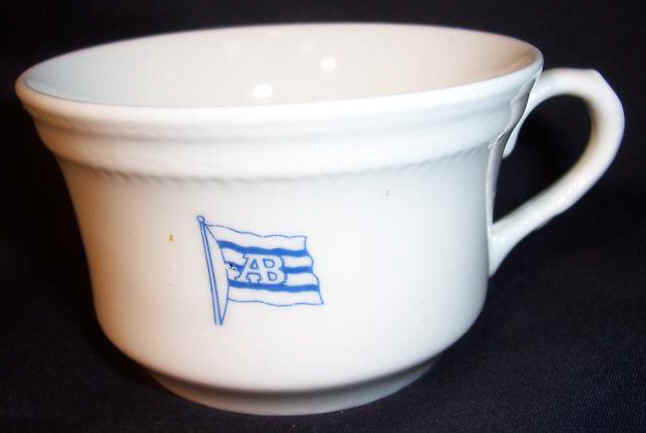 Scarce original early United States Shipping Board bowl manufactured in the early years of the Twentieth Century for use in its ships’ wardrooms. In the early days of World War I, 470 ocean-going cargo-ships were sunk. We were in desperate need of sufficient cargo-ships to keep troops supplied with food and munitions of war. It was under these trying conditions that the United States Shipping Board and the Emergency Fleet Corporation assumed the task of acquiring, building and operating sufficient cargo-ships to maintain an army in France . Considering the program as a whole, the accomplishments in the number of ships constructed, the tonnage secured and the time within which the ships were completed and delivered, constitute the most remarkable achievement in ship building that the world had ever seen until World War II. Bowl is of heavy white institutional type china. With little if any wear, free of any cracks or major defects. Pattern includes grey shield with three stars over the letters “USSB”. Bottom labeled “ Buffalo China 1928”. Bowl measures 6 7/8” diameter. Quite scarce. $44. 10436. (dish) American Mail Line c.1922-1938. White round dish with blue/white/red flag logo on the rim. Measures 6 3/8” diameter. 7 1/8” x 5 1/8”. Marked on bottom "Buffalo China” “UEA”. H. F. Alexander's Admiral Line started a service between Seattle and the Far East under the name of the Admiral Oriental Mail Line. The company was taken over by the Dollar family in 1922 and re-named the American Mail Line. The Dollar and American Mail Lines were taken over by the government to prevent their bankruptcy in 1938 and the former was re-named American President Lines. American Mail regained its independence at this time. Following privatization after the war, the company was re-acquired, by American President Lines in 1954. The use of the American Mail Lines name and flag ended in 1973. American Mail Line vessels included the President McKinley, President Grant, President Jefferson, President Jackson, President Madison. The American Mail Line operated Trans-Pacific Steamship Routes between the ports of Seattle, Victoria, Yokohama, Kobe, Shanghai, Hong Kong, Manila, Honolulu and many others. Clean, only very light wear. (VG+). $46. 10423. (cup) American Banner [Steamship] Line c.1959. Vintage cup made for the American Banner Line measures 3 ¼” in diameter by 2” high. The American Banner Line operated passenger service between New York and Amsterdam from 1958 to 1959 - only two years! The line's only ship, the Atlantic, was purchased by the American Export Lines in 1959. Logo is the ship flag with "AB" in white lettering within a blue and white horizontal striped flag. The ship's flag logo is bright, sharp, and clear. No chips, cracks or crazing. Excellent condition - shines like new. (F-). $44. 10412b. (oval dish) American Export Lines Inc. c.1964. White with one blue and three mustard color bands. Measures 7 1/8” x 5 1/8”. Marked on bottom "Sterling China East Liverpool… Made Expressly For American Export Isbrandtsen Lines. USA E-2". American Export Lines, New York, was the biggest US-flag shipping company between the US east coast and the Mediterranean from 1919 to 1977, offering both cargo ship services and passenger ship services, until declaring bankruptcy and was acquired by Farrell Lines, New York. The company went through various reorganizations and became the “American Export Lines” in 1936. In 1964, it merged with Isbrandtsen Co. to become the American Export-Isbrandtsen Lines. Clean, no stains of marks. (F-). $34. 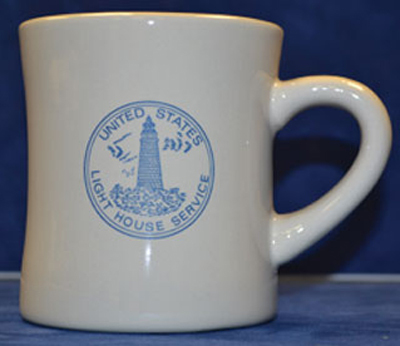 Now Available: Reproduction United States Lighthouse Service & Lifesaving Service heavy weight 10 ounce mugs. $8.95 each. 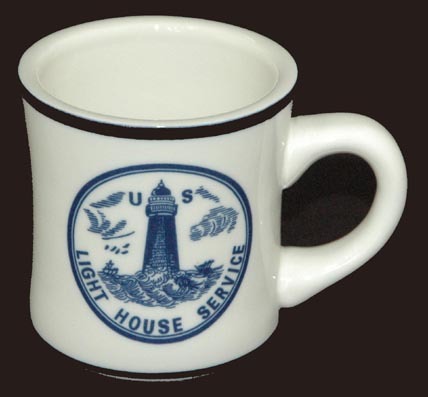 We now have in stock United States Lighthouse Service and Life-Saving Service Logo Dinnerware. Referred to as the “Navy Blue Collection”, this line of dinnerware is made to military specifications. 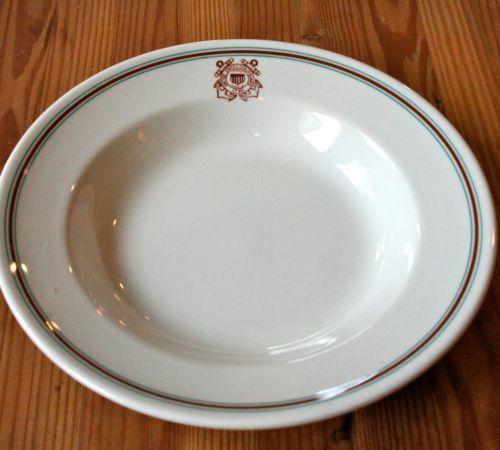 It is made of restaurant grade china similar to that used in hotels, restaurants, on ships and elsewhere and is tough enough to last in these high wear environments. They will not fade and will continue to look good for years to come. In addition, they are microwave and dishwasher safe, and contain no lead. We also offer book search and research services....please inquire. For a sample illustrated catalogue, please forward $3 in US postage or US funds (refundable with your order). This site is continually updated. This page last updated September 19, 2018 .